Richard Molinari, DC (Parsippany) - Book Appointment Online! Improve your overall health and well-being with services from our chiropractic office in Parsippany, New Jersey. 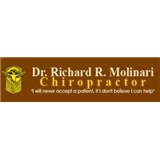 Serving the North Jersey area since 1985, Dr. Richard R. Molinari Chiropractor is a one-doctor family practice providing personalized, individual service with specialties in automobile and traumatic injuries. Dr. Molinari has been treating patients from New Jersey, New York, and Pennsylvania for more than 30 years. In his home office, he treats back pain, neck pain, sciatica, headaches, arm and shoulder pain, disc problems, allergies and many other health conditions. Dr. Molinari was recently honored as a "TOP Doc in New Jersey for 2017"
He took the time to listen to my concerns, and then explained what would be necessary to treat my back pain. In follow-up visits he has been kind and efficient. I'd recommend him to anyone.